Preclinical studies demonstrate that CAI, the active component in CTO, inhibits VEGF, Akt, and Erk activity. 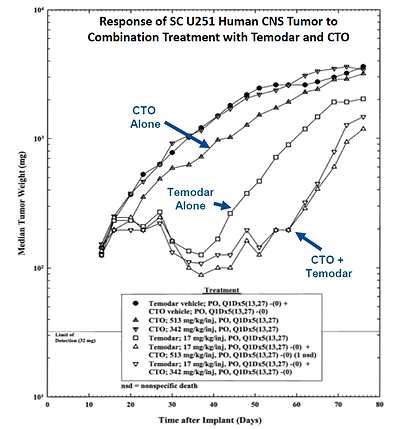 A murine glioblastoma xenograft model demonstrated that CTO in combination with Temodar significantly inhibits tumor growth. U251 human glioblastoma cells were subcutaneously implanted into male, athymic NCr-nu/nu mice. CTO demonstrated the ability to cross the Blood Brain Barrier in preclinical models and in GBM patients. Source: Karmali, RA., et al., Cancer Therapy 2011, 8:71-80.